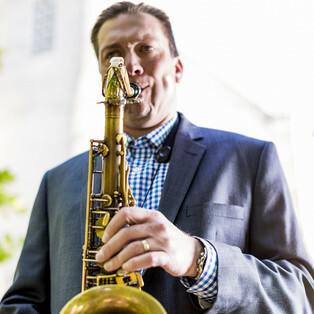 Saxophonist John Wojciechowski is an urban musician through and through. He grew up and developed his powerful tenor sound in Detroit—“a really rich community with a lot of great players,” he says—and since 2002 has thrived in Chicago, working alongside some of the best players in the city. So why does he live way the heck out in the Windy City’s western suburbs in a place called Bartlett—where it takes a good half-hour to even reach one of the highways leading into the city? And does being so far away from the action have an impact on his music? The answer to the first question is that “Wojo,” as he is known, teaches high school in the historic river town of St. Charles—no doubt one of the only jazz musicians of his caliber who can make that claim. The answer to the second question is that being out and away from all the noise and congestion isn’t such a bad thing for an artist. It helps you to . . . focus. It certainly helped Wojciechowski concentrate on the making of Focus, an impressive step up from his previous album, Lexicon, as good as it is. Boasting seven strong original compositions, each one reflecting a different aspect of his style and personality, Focus is one of those supremely enjoyable albums that treats the mainstream not as a comfort zone but a central place from which to push stylistic boundaries and assert original ideas. Backed by a remarkable, tightly knit unit including drummer Dana Hall, bassist Dennis Carroll, and pianist Ryan Cohan, Wojciechowski ranges from the earthy intensity of “Summon the Elders,” a spell-casting modal piece reminiscent of John Coltrane and Pharoah Sanders, to the bottom-up inventions of the title cut to the dancing 3/4 patterns of “Twirl,” on which he shows off his lyrical tenor saxophone sound. The two covers on Focus reveal Wojciechowski’s compositional gift as well. He remakes Thelonious Monk’s “Evidence” with the clave-informed Latin arrangement and reharmonizing touches he showed off at the 1996 Thelonious Monk Competition (he placed third behind Jon Gordon and Jimmy Greene). And showing off his love of Sonny Rollins and Joe Henderson, he treats Dave Brubeck’s enduring “In Your Own Sweet Way” to a coiled, melodically expansive alto trio reading. And then there is “Call of the Kingdom,” which began as an unaccompanied drum introduction by Hall to “Summon the Elders,” but made such a strong compositional statement of its own that the leader assigned it its own track and Hall a songwriting credit. Elvin Jones, among other percussive orchestrators, would be proud. The 41-year-old Wojciechowski was born on November 9, 1973, in Mount Clemens, Michigan, 24 miles northwest of Detroit. His father was a sheet metal worker by day and a jazz organist by night in the manner of such B-3 favorites as Don Patterson, Jimmy McGriff, and Richard “Groove” Holmes. Young John started playing music at age 8, when he figured out how to play his grandmother’s favorite song, “Somewhere, My Love” (“Lara’s Theme” from Dr. Zhivago), by ear on melodica. Recognizing his son’s aptitude, his father asked him what instrument he wanted to play. “I chose the accordion because I wanted to please my grandmother,” Wojciechowski says. “He said, ‘Pick again.’ I chose the saxophone because I was drawn to its sound.” He was particularly drawn to the sound of alto great Sonny Stitt, who made such a stellar contribution to countless organ groups of that era. Wojciechowski père went to extra lengths to find his son a good teacher and found a winner in Gerry Gravelle. “He knew all the vocabulary,” says Wojciechowski, who by the time he was in middle school was playing alto saxophone, plus clarinet and flute—a rare ability for someone that age—and was conversant with the Great American Songbook. By the time he was in high school, John had studied with George Benson—not the popular crooning guitarist, but the respected saxophonist who played on many Motown recordings. Though Wojciechowski had no intent of teaching, his jazz elders convinced him it would be a good idea to get a music education degree. So he did, at Western Michigan University. After graduation, he went to New York, where he discovered after about six months that he “didn’t want to live there forever,” because “I was too young and the city was too fast.” He moved back to Detroit, took up teaching and performed locally, by then working on his tenor saxophone playing. In 2002, his wife, laid off from her advertising job, landed another job in Chicago. With gigs drying up in Detroit—his friend, the brilliant drummer Gerald Cleaver, had just left for New York to find work—Wojciechowski made the move to the Windy City. “I knew people there,” he says. “I knew the scene was really good.” And he knew there would opportunities to prove himself. In no time at all, he found himself in such impressive settings as the Chicago Jazz Orchestra, of which he was a member when trumpeter/flugelhornist Clark Terry headed up a new recording of Porgy and Bess. In 2004, he began teaching at St. Charles North High School following a couple of other school jobs. Far from putting a throttle on his creativity, the teaching gig helped him expand his artistic base. At St. Charles, he teaches Jazz Bands, Music Theory, and, by popular demand—the administration’s—Orchestra. To gear himself up for Orchestra, which he had never previously taught, he studied a lot of Beethoven and, he says, was blown away by the economy of his writing. Over the long run, classical elements have seeped into his jazz sensibility the way the sounds of Motown did when he was younger. “Elegy,” a beautiful piece written for his father, who died two years ago, captures both the gentleness of the man and the hard times he underwent dealing with illness. “I don’t usually do programmatic pieces,” says Wojciechowski, “but this was really a composition that wrote itself.” A lovely, flowing solo by Cohan, whose brilliance as a writer informs his improvising, contrasts with the increasingly hard-edged tenor solo that carries the song home. “Divided Man,” which reflects Wojciechowski’s dual existence as a high school teacher and jazz musician—it boasts two separate sections, of course—is beautifully rounded piece that shows off the deep-seated unity of this band. Wojciechowski has been playing with Dana Hall and Dennis Carroll almost as long as he has been in Chicago. He is among a long list of jazz musicians who love the way Carroll challenges him harmonically, pushing him to places he wouldn’t otherwise go. “He allows you to leave space,” says Wojciechowski, who also raves about Carroll’s deep textural abilities. Wojciechowski first played with Hall in a band led by pianist Joan Hickey. Hall appeared on Lexicon (2009), along with Carroll, guitarist Dave Miller, and pianist Ron Perrillo. The saxophonist, a member of Hall’s group, “spring,” was featured by the drummer in a live performance of tenorist Charles Lloyd’s reissued 1965 recording, Of Course, Of Course. Wojciechowski also has performed in pianist/arranger Laurence Hobgood’s first post-Kurt Elling band and with such outstanding young artists as pianist Jacob Sacks, bassist Jeff Campbell, and trombonist Joel Adams. Whether leading his own group or furthering his already distinguished career as a sideman, Wojciechowski brings to bear a consummate understanding of where past meets present (the title of one of his previously mentioned songs was inspired by Cohan’s exclamation, “You really summoned the elders!” after one of his performances), where Detroit meets Chicago, and where learning meets teaching and where dedication meets execution. Among recent albums, few home in on those pivotal places more enjoyably—or with greater focus—than Focus.